I came across this book while working at a local school. It was the year six reader for that term. It is not readily available in stores however it can be purchased online. Tiff and the Trout is a brilliantly written book dealing with the issue of divorce and how it affects each member of the family. The story is set in Victoria and the main character of the story is Tiff. The book is written through her eyes. Tiff is in year six and lives up in the mountains with her mother. Her father and younger brother live down the mountain. Since her parents' marriage fell apart Tiff’s life has changed dramatically. She doesn’t come home to find her father and brother. She misses them terribly and wishes they were all still a family. Like most children she struggles to find her place in this new situation. She loves both her parents and tries to support them and at the same time tries desperately to deal with her own emotions. Tiff’s dad is from the country, he loves the mountains, the village and the people. Tiff’s mum on the other hand was raised near the beach. She loves the city, the water, and the rush of traffic. Just when it seems as though Tiff is settling into her new life her mother is offered a job in Surfers Paradise. She accepts the job and the house Tiff grew up in goes up for sale. Tiff is now left to decide where and who she wants to live with. Throw in her mother’s new boyfriend, a best friend, a big trout and a fishing trip gone wrong and life is certainly dramatic/confusing and overwhelming for Tiff. Even though the story is based on Tiff being the main character the author gives us a glimpse into each member of the family. Her dad is easy going, enjoys his job and loves the environment he lives in. We also get an insight into Tiff’s mum and I must admit it was her mum’s character that I felt most drawn to. She moved for love. She left her family, the place she grew up and loved. She tried to make a life for herself and her family in Victoria. Inside however she could never settle and even though she was a great mother as a person she got lost along the way and was so desperate to find something that was about her, something that would bring her back to life as a person. She hates the mountains, she hates being secluded and generally is very unhappy and always seems unhappy. As a mother of two children I could completely identify with this character and her desire to find the person she was before she got married and had children. I am sure there are many of you out there who could relate to this. We devote so much time to our children and our families that we wake up one day and wonder where the time went and what is there for us. This is not to say we are not happy where we are, this is more about when it is all said and done and the children have gotten older, who are we then and where do we fit in. With the job offer in Queensland Tiff has a very difficult decision to make. She doesn’t want to leave either parent and especially her brother and best friend Cass. Tiff is like her father, she loves the mountains and the country. This is her home. She also loves her mother and feels guilty if she doesn’t go with her. 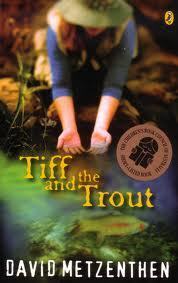 Tiff and the Trout, has been written in a way where everyone in the family has a voice. Divorce has always been seen from the parent’s point of view as they are the main players. However children have a voice as well and allowing them to express what they really want will play an extremely important part in how they deal with it. The most important message in this book is that no matter what outcome Tiff chooses she knows that both her parents love her and her brother very much. Her happiness is extremely important to them. Tiff goes to spend time with her mother in Queensland and finds that the beach and a new friendship may not be as bad as she first thought. Ultimately she knows in her heart where she wants to be and her choice is accepted by her parents. Tiff and the Trout deals with current issues for many families and the reality of how hard divorce can be on each person. With Tiff as the central character the audience for this novel is between 12 and 17 years old. However, I honestly feel that it can be of benefit to anyone going through the process, be it a mother, father or child. The last time I humiliated myself.